"Ah, the Clydesdale, the world's most magical horse, and arguably the most recognized. 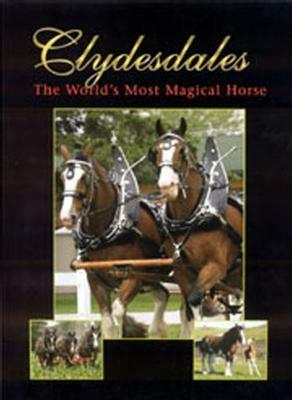 Long a favorite of fans that enjoy watching their celebrated high-stepping gait while their beautiful flowing hair above its hooves (feather) flutters in the wind, Clydesdales are indeed a mystical breed whose roots trace more that one hundred years ago to Scotland. "Now the true story of the Clydesdale is told in all its essence. Readers will be fascinated with the history of the Clyde, its evolution to popularity around the world, their near-disappearance from view in the United States, and the resurgence to near-legendary status due to the fame of the magnificent Anheuser-Busch Budweiser Clydesdale hitch team. So enjoy the folklore that is the Clydesdale, one that includes tips about how to own and show this amazing animal. And learn why it's not surprising that to those who say, 'Here come the Clydesdales' an immediate smile covers their face."